In this article we are going to take a look at the white Labrador. Answering all of your white Lab questions and giving you the best white Labrador information. 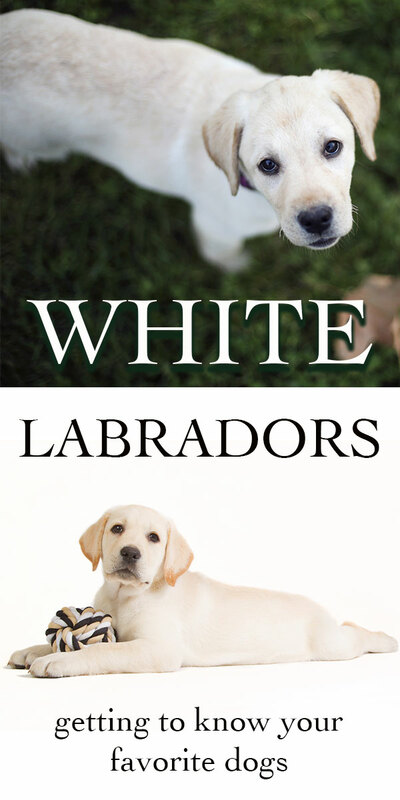 [wp_ad_camp_5]Find out whether the white Labrador is an albino Labrador, where white Labradors come from and how to find the right dog for your family. Albinism is an interesting trait that is found throughout the animal kingdom. It is caused by a gene which switches off coloring. Albino animals will have white hair or fur, and pale skin. They may also have red eyes, although very pale blue eyes can also be seen in some albinos when some pigmentation remains. True albinism in dogs is rare, and it is not a desirable trait as unfortunately it comes with health problems. These include risk of cancer and visual defects. Fortunately, a white Lab is almost always not actually an albino Lab. It is actually just a very pale version of a yellow Labrador. White Labrador Retrievers will have pigmented noses and dark eyes, as well as distinctive white fur. Their fur will almost always contain touches of cream or yellow, especially around the ears. A white Lab puppy will often have yellow ears. Where Do White Labradors Come From? 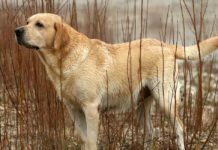 Yellow Labradors have always come in a range of shades, and this range has been deliberately broaden in recent years through selective breeding. There are only three recognised colors of Labradors – black, chocolate and yellow. [wp_ad_camp_2]White Labs and Fox Red Labs are both classified as yellow Labs, as although the hues look very different they are just variations of the same base color. Yellow Labs can now be commonly seen ranging from darkest rich fox red, through shades of golden, pale yellow, cream and even white. What is considered desirable or fashionable changes from one decade to the next. And certainly differs between the show and working communities of Labrador breeders. In the 1950’s and 60’s a rich dark yellow was popular, but since then Labradors have swung back and forth a fair amount. Currently working or American Labradors prefer the darker shades of yellow, and English Labradors are often much paler. White English Labs are increasingly popular show bred lines. In the USA this type of Labrador is known as the English white Lab. English Labs different from American or Working bred Labs quite dramatically in terms of their shape and personalities. 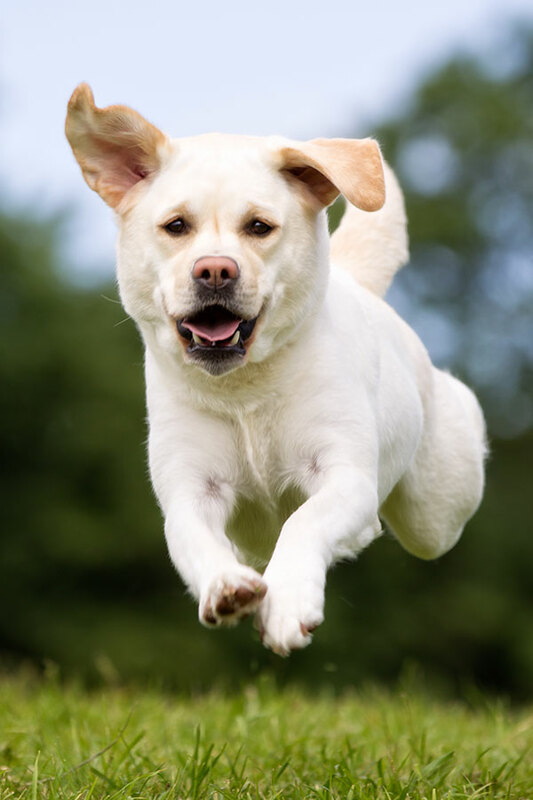 A white English Lab will also often have a broader chest and head, as well as slightly shorter legs. You can find out more about the difference between show bred and working bred Labradors in this article. 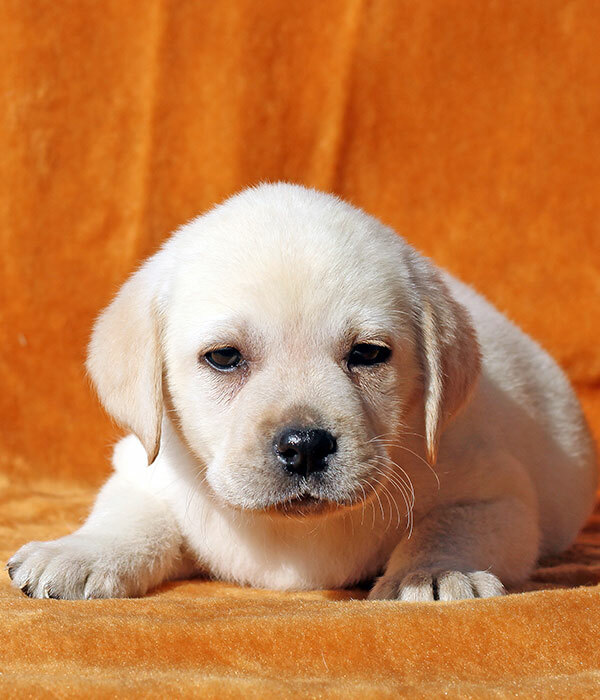 White Labrador puppies will come from parents who have the genes for yellow coat color, and who have been selectively bred to have the palest version of this color. Puppies coats will also change color as they grow, so a white puppy may appear more or less pale when he matures. It’s therefore very important not to hang all of your hopes on getting a pure white pup. Even if you love white Labs, remember that the most important thing about a puppy is their personality and their health. Health testing is very important, whatever the color! As with any puppy search, the way to find a white Lab puppy is to look for a litter of Labradors bred in a way that is appropriate for the breed. If a white Labrador appeals to you, then make sure that the breeder has not focused on color to the detriment of health or temperament. Color should always be a secondary consideration when breeding a litter or choosing your puppy. First make sure that all of the other boxes are ticked, and that you are happy with your breeder. [wp_ad_camp_1]Make sure both parents are fully health tested. For Labradors this will mean low hip and elbow scores, and clear eye tests as a minimum. Ensure that the parents’ temperaments match what you are looking for in a puppy. If you want a pup to show in the ring, then go to an established show breeder who will be able to help you select the best pup for your purpose. If you are looking for a family pet, make sure both parents are treasured members of the family too. When buying any Labrador puppy, making sure the breeder is a good breeder is key. Here is some more information on how to find a good breeder, for any color of Labrador. 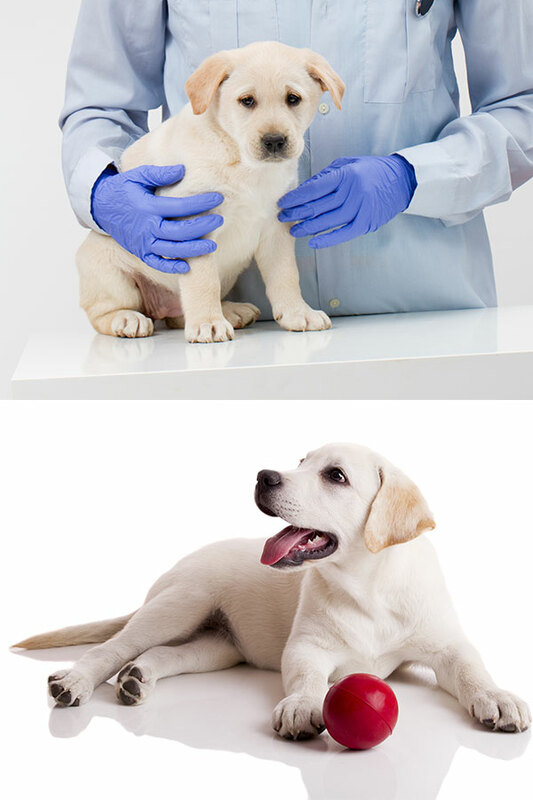 Once he arrives home, caring for your white Labrador puppy will be exactly the same as caring for any other color of Lab. It’s normal to have a few trials when a puppy arrives in your home. The main ones which Labrador owners deal with are regarding potty training and biting. You can find lots of information on dealing with both of these common issues in our extensive Puppies Section. Bringing a new puppy home is a big decision. If you have any doubts about whether you are ready for a Labrador check out this article to help make the right choice. 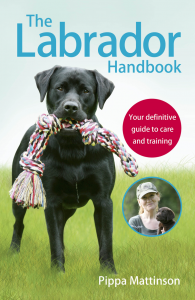 The Labrador Handbook will help you to decide which type of Labrador is the right dog for you, and take you through keeping him healthy and happy for the duration of his lifetime with you. I have a very sweet white lab. Her name is Pearl and she is the best! She is a Dudley, and her nose is pink in the colder months, but retreats to a darker brown to black in the spring/summer. We own her father, Indy, an 8 year old English, block-headed black lab. He is very mellow and a complete cuddle-bug! Sadly, he has a love for food, and will automatically sneak food off the table or counter when you aren’t looking. Thank goodness Pearl didn’t receive this trait. Anyway, Pearl’s mother lived on a farm and was a crazy dog. She was somewhat feisty and we believe she had hunted animals on the farm. We have seen this trait in Pearl, for she gets cocky and riled up during walks. When we pass other dogs, her fur goes up (a time that my dad calls ‘cockatiel’) and she growls. She has bit other dogs in the past, and her posture during walks is that of the ‘alpha female’. She is very dominant during this time and we have sent her to training in the past. Sadly, nothing has worked quite yet. Do you have any solutions? Can we break her from the traits? And if the solution is training, how much? If I can any answers to my questions that would be great! Thanks! We gave our (white) Lab puppy a fat stick to chew when we wanted to play or pet him. Now, as an adult he goes to get his “stick” before he comes to be lovey with us. He knows he’s NOT to bite us. If your pup does bite, yell “OUCH”. They’ll figure out quickly that they are hurting you. Hi Jane! This is an interesting tip to use, that I will try when I get a new pup! Thanks! Labs are the best dig you will ever own. That puppy biting is just playfulness. A Lab stays a puppy for a long time. At least 2 years. They will chew your house down if you don’t kennel them every time you leave the house. They are alot of work when they are puppies, but worth the effort. They are the puppy from hell, but the dog from heaven? A 9 year rotti and a 5 year Labrador/rotti both are good dogs. I have a off white Labrador of 5 months , his ears colors are now changing into light yellow color….. Would be that albino.. I have rescued a white lab sort of a little yellow to fur with sky blue eyes and pink nose and pink mouth. Is this dog at risk for cancer?And how rare is she 51/2 months old. I have a yellow lab with pink nose and mouth. He had blue eyes when he was a puppy, but then his eye color changed to a mix of yellow and brown. pink nose and mouth indicates your dog is also a dudley lab which i believe is not a problem. My dog is 2 years old now and he is doing perfectly fine. I have a fox red lab and I know you can get black, brown, yellow lab and the white is classed as yellow I think and on the Internet there are grey labs. I guess if the dog is a true lab you have to have papers and be recognised by the kennel club. I have a 3 month old white labrador with a little yellow/ cream color on her back and ears.. she is a dudley.. no pigment in nose and eye lids.. her ears arent as floppy as lab puppies look in pictures. I was wondering if her ears with grow with her and become more floppy.. ?